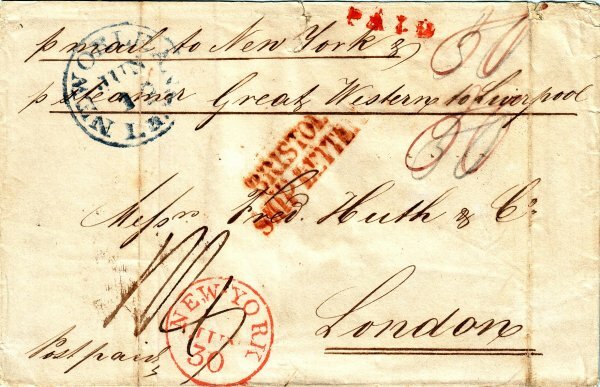 Double rate entire sent from New Orleans via New York and Bristol to London on board 'Great Western' in June 1840. Double rate inland to New York 2x 25¢ = 50¢, '50' in manuscript. Ship Letter Fee: 2x 8d = 1/4d, '1/4' in manuscript. US inland rate per sheet for more than 400 miles: 25¢; effective 11th March 1825 to 1st July 1845. The GB ship letter fee and inland postage combined per ½ oz: 8d; effective 10th January 1840. 'PAID' applied in New Orleans. 'BRISTOL / SHIP LETTER' Robinson type S8, in use 1840-41. Freight money was charged by the Pioneer Steamship Companies sailing from New York at 25¢ per sheet. US postmasters collaborated via the New York post office to allow customers outside New York to pay the fee at their local post office. The New York post office paid the steamship companies.